FBI: D20 MODERN The FBI's history ranges from some of the most glorious moments in law enforcement history to some of the most tragic. Its authority ranges from terrorism to organized crime to political malfeasance to computer crime and much, much more. Its agents have a reputation as the most talented law enforcement officers in the world, but the criminal world continually finds new ways to test their abilities. This books gives players the chance to work with the FBI or some of the world's other famous police forces. Detectives, forensic scientists, profilers and more all have a role in battling crime - or in trying to clean up the FBI itself! 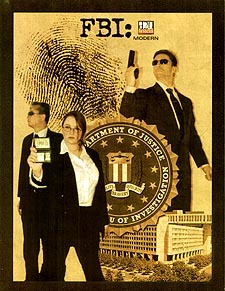 Real-Life Roleplaying FBI comes with everything players and gamemasters need to recreate the greatest triumphs of the FBI and battle the most dangerous criminals in the world. * A variety of alternative law enforcement campaigns.